The first half score may have been closer if the Demons had not missed 5 free-throws. DePaul had an annoying 6-11 from the free throw line in the 1st half, looking to blow another game at the charity stripe. In the 2nd half, things went quite differently for the Blue Demons from the free-throw stripe. As a team, they shot 80.9% (17-21) which sealed the game. Coach Dave Leitao kept a super short rotation of 7 players, his starters plus Paul Reed and Justin Roberts. This made a lot of sense, and this is also how a lot of successful coaches manage their teams. It allows for the core group of players to stay in rhythm. A key junction in the game was when Tre’Darius McCallum picked up his 3rd foul, early in the 2nd half. When Paul Reed took his place, DePaul was down 7, 35-28 with 19:39 left in the game. From that juncture forward, DePaul went on a 24-5 run to take control of the game. At the beginning of the run, to draw DePaul almost even in the 2nd half, Eli Cain went for the And-0 with 17:24 second half. A brilliant pass by Paul Reed to Marin Maric put DePaul up for good. In the middle of this run, the Golden Eagles went on 6 minute scoring drought. It was nice to see another team struggle to score. The run ended with this beautiful pass from Cain to Maric. After that point, the Demons got most of their scoring from the stripe. DePaul made 12 free throws in a row to kill off the last 7:36 of the game. Being it DePaul and everything, the writer NEVER felt comfortable, and was terrified to tweet during the second half. 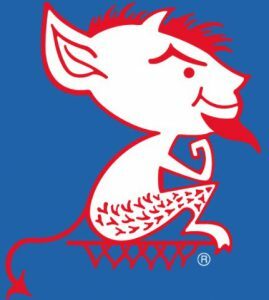 But alas, your DePaul Blue Demons won the game, and ended the Losetrust moniker. The crowd was basically 60-40 or 55-45 with more Marquette fans. Wintrust needs to iron out crowd control issues badly. The parking garage was full before the game, and there were few options to park closer if the garage was full. Very annoying for this writer, who got stuck in Saturday morning traffic, and then needed to find street parking. Oh, the hard times I have faced! The food and beer lines were apocalyptic. In the food lines it seemed like it took 4 to 5 minutes per order. I am not kidding. I went without food or drink. Oh, what a tragic day! As mentioned earlier in this post, Strus scored 20 points and had an Offensive Rating of exactly 100. The main negative was that he had 6 turnovers. That definitely knocked down his rating. I also need to complain that sometimes Strus tries to sell the foul when shooting a 3 pointer, and in the process he generally takes a God-awful shot that has a zero percent chance of succeeding. He took two of this type of shot. But when it was clutch time, and he needed to step up to the line, he was a perfect 7-7. The rest of the squad shot shot 64% from the line. Against a guard heavy lineup, Cain only had 1 turnover. Granted he only had 3 assists, but 3-1 assist to turnover ration is not bad. He went 8-11 from the free throw line, which was much needed offense. He did not shoot particularly well from the field, going 3-13 from the field, but all and all, a very positive day for Cain, with a just below avevage 97 offensive rating. Brandon Cyrus joined Cain with a 97 rating. He played quality defense against 2 of the most dynamic scorers in the Big East. He ended with 13 points, 3 rebounds, 2 steals, 3 assists and 2 turnovers. He was active and played 35 minutes. With McCallum’s foul troubles, Paul Reed played 23 minutes. He had 2 points on 4 shots, 3 assists, 8 rebounds and a block. He played quality defense, and once he came in during the beginning of the 2nd half, DePaul went on a large run. When he isn’t reaching, he is one of the better defenders the team has. He can guard bigs and smalls due to his length and quickness. He only ‘obviously bad’ defensive play was when Andrew Rowsey pump faked him on a 3-point try. Reed fouled him, which was pretty much an automatic 3 points for Rowsey. He did not fall for the same trick when Rowsey tried to do it again later in the game. Marquette shot 33% from 3 point land in the 1st half. DePaul tightened up their defense at the break, and the Golden Eagles shot only 27% in the 2nd half on 5-18 shooting from beyond the arc. For the game, Marquette shot 29.6% from 3 point land. This is a team that on the season has shot 40.8% coming into the game (10th best in the country.) Now they are 15th best in the country. The Demons limited the Golden Eagles to .86 points per possession easily the worst offensive game for Marquette this year. Their previous worst was against Xavier with .95 points per possession. The Cheese-eaters went from 12th most efficient to 20th most efficient after the game. DePaul owned the glass. The Demons had 19 offensive rebounds, while allowing the Golden Eagles only 6 Offensive rebounds. On the game DePaul out-rebounded Marquette by 19 total. Keeping the team on a 7 man rotation was excellent. Play your 7 best guys. The team defense was excellent, and that is based on coaching, desire, and communication. Paul Reed has come a long way in team defensive priorities. The help and recovering by the team was pure joy to watch. The offense is still the clogged toilet offense when Cain is not on the floor, but the plunger worked just enough to win. Tre’Darius McCallum got himself into foul trouble, and it probably helped DePaul. I do not think it was a coincidence that the Demons went on their big run once McCallum picked up his 3rd foul on the opening possession of the 2nd half. At that point DePaul was down 7. They soon went on a 24-5 run to take control of the game. To illustrate some of the issues that McCallum has had, and how it has collectively hurt the team, especially Maric and Strus who generally get over for help defense, I have 5 plays strung together that give a good picture of the issues. On the pick and pop, he completely loses him man, Hauser, who gets a wide open 3 pointer. Tre loves trying to make the spectacular steal (which he makes about once a game), and when he misses it, Hauser gets him out of position, which makes Maric help. Maric causes Hauser to miss, but Maric’s man now had offensive rebounding position and converts on the follow up. On this one, he properly helps Maric recover from a pick and roll, but when rushing out to challenge Sacar Anim, he gets himself out of position and picks up his 3rd foul. He gives up the baseline, realizes his mistake and elbows Hauser out of bounds, picking up his 4th foul. These 5 plays collectively lead to 9 points plus Marquette getting the ball for a throw-in. So on the first 4 plays, Marquette scored at a rate of 2.25 points per possession. Of course, I am cherry picking plays in the game, but in past games, when Maric, Strus, Cyrus or Cain have helped, they have picked up fouls. Keep your eye on him during the next couple of games. Once you see it, it can’t be unseen. There were a few, but I am going to go with 2. This gave Cain some confidence, and basically tied the game. The Demons continued on their run, and took control of the game. Since DePaul beat Marquette, who had beaten St. John’s who had just beaten Duke and Villanova, the Blue Demons took a hell of a lot of land. Take a picture of this one, because it will not last long! To View the entire breakdown of this Momentous Occasion, check out this link. DePaul Controls the 3rd Most Population, the 2nd Most Counties or Parishes, and the 2nd Most Territories. Enjoy it Blue Demon Nation. We earned it! There were a lot of happish DePaul fans, so there are plenty of tweets to choose from. There were Actual People at the Game! Shout out to the Team Defense! Who Says This Isn’t a Rivalry? That's only the third sub-100 KenPom conference loss #mubb has had since 2010. All three were to DePaul.